The RockBoard range is a one-stop shop that easily facilitates putting a pedalboard together. Headache over. Full range of pedalboard accessories in one place. Slots allow easy cable access. Patchbay modules keep connectivity tidy. There are many advantages to owning a pedalboard, not least turning up at a gig and having all your pedals in one place ready to go with a minimum of faffing about. That said, while putting a pedalboard together can be a labour of love, it can also be a frustrating and time-consuming one, too, with plenty of decisions to be made along the way. Now, Warwick doesn’t claim to have all the answers, but the company has gone a long way to take some of the uncertainty out of the process by releasing the RockBoard range, encompassing everything you need to put a functioning pedalboard together (except the pedals, obviously). The RockBoard range includes basic metal pedalboards in seven sizes, each with optional matched gigbags and flight cases, modules providing audio and power connectivity to the ’board, power supply facilities and a wide range of cabling options. Putting together a system starts with the RockBoard pedalboard itself, which is available in sizes from 460mm to 1,020mm in width. The metal ’boards, which sit firmly on solid rubber feet, are rugged but not too heavy - the ’board frame is constructed from a single folded, cold-rolled aluminium sheet without any welded seams. Structural integrity and rigidity is provided by the use of U-shaped support braces under the mounting surface. Our QUAD 4.1 model (£121) supplied by Warwick for the review has one central brace from front to back, while the larger ones have two or three. The sloped top-mounting surface is covered with slots for running cables through to underneath, keeping things neat and tidy, but still has plenty of solid surface available for mounting pedals. With our QUAD 4.1, this translates as six 30mm-wide strips across the ’board with narrower (15mm) ones at top and bottom, the suggested mounting method being to attach the provided 25mm Velcro strip to the six. Any power distributor that you want to use can be mounted under the surface as there is a universal power supply mounting solution called The Tray (£10) that fixes into slots below the ’board. There are also specific mounting kits available for Voodoo Lab’s power supplies. Warwick has several of its own power supply solutions, including the RockBoard Power LT XL (£55), a rechargeable power supply to keep your ’board independent of mains power. Pedaltrain is probably the best-known brand when it comes to pedalboards, with ’boards available in many sizes. The design is different to the RockBoard in that, instead of many small slots in the mounting surface, these have larger continuous slots, running the full horizontal length on the smaller ’boards. If you’re looking to connect your pedals together with solderless cables that you can trim to size, you may wish to look at offerings from George L, Evidence Audio or Lava Cable. Finally, for quality ready-made connections between pedals, try EBS Premium Gold flat patch cables, available in four lengths. 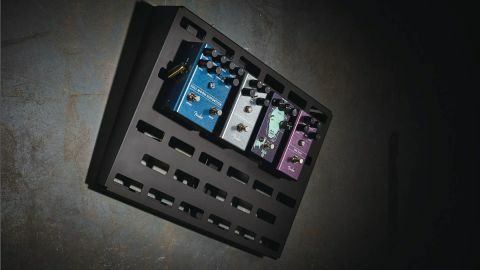 On the front face of each pedalboard (except the smallest DUO 2.1) is a slot for inserting a patchbay module to provide connectivity - simply run a through connection from the sockets on its front surface to those on its rear sitting under the ’board. There are three options available. The MOD 1 offers five standard 6.4mm connections (plenty for implementing the four-cable method), an XLR, and mains power connectivity via IEC and a barrel connector for plugging in a nine-volt adaptor (such as the 1700mA RockBoard Power Ace at £19) to route to any pedal(s). The other module options are the MOD2 with MIDI and USB options, and the MOD3, which, with extra XLR connections, is aimed at vocalists. As for cabling, there’s a wide range of patch leads in various lengths featuring space-saving flat cable with slimline right- angle plugs, including the premium Gold and Sapphire cables with gold-plated contacts. There’s also the PatchWorks solderless cables and plugs so you can customise sizes, and, for identifying those cable runs, there are colour-coded wrap- around rings. In use, we didn’t come up with any problems, apart from the mounting holes for the MOD 1 needed widening to take the provided screws (however, this was easily done with the provided tool). The size of the 4.1 is very practical for a medium-sized pedalboard. It’s a comfortable fit for two rows of five Boss compact pedals without anything hanging over the edges. Of course, with any multiple pedal setup there’s the potential for a rat’s nest of cabling underneath, but the slot system makes it easy to keep things under control by using cable ties. One of the beauties of this system is its flexibility. You can easily rip it apart and start again if you find the positions don’t suit or you need to add more. Once you’re set on your pedals, their ’board positions and order in the chain, use solderless cable cut to size to keep things neat. The underneath is not just for power supplies and cabling, either. You could use it to place a buffer (incidentally, there is a RockBoard Natural Sound Buffer in the range) or any small pedal that is always on, even perhaps pedals connected to a switcher located on the top surface. With a clean, uncluttered surface for pedal mounting, but with easy access to underneath where there’s enough space to keep all the cabling, power supplies and so on, what you’re getting here is a classy and practical pedalboard design. Whatever size ’board you need, there will be something that suits, from the smallest DUO 2.1 to the massive CINQUE 5.4, which is just over a metre long and 416mm deep. However, it’s the comprehensive nature of the full range of items in the system that most impresses. The RockBoard range is a one-stop shop that easily facilitates putting a pedalboard together. Headache over.